With the terrarium-like swelter of recent weeks, you might assume the current show at Darger HQ — Hothouse — was commissioned just for this summer in Omaha. But don’t expect to find tropical plants or Bikram yoga classes here; it’s a different kind of hothouse to which artists Elizabeth Kauffman (Salisbury, MD) and Luke Severson (Omaha, NE) have responded. Kauffman has contributed a series of lush watercolors inspired by her own parenting experiences, while Severson offers a sculptural metaphor in concrete around the distinctive rearing of celebrity family, the Jacksons. Hothousing is also a term that applies to the parental practice of encouraging children to master skills faster than their average developmental age. Why wait? Infants and toddlers have nimble and curious minds. Who says you can’t or shouldn’t read by the age of 2, add like a calculator at 3 or play piano like a concertmaster at 4? It might help you achieve in the competitive world of pre-K, let alone set the stage for a creative, enriched and fulfilling life. Among parenting strategies, hothousing is diverse and controversial, as you might imagine. As an anxious new parent, Kauffman has been confronting the wealth of advice on how to raise a child. How to keep them safe, nourished, happy and engaged. The age of social media has propelled those channels of information well beyond that of your pediatrician, Dr. Spock and Dr. Phil to legions of websites, blogs and tweets. These can be great tools and are available 24/7, so that when baby cries in the midnight hours, you might find some helpful hints or at least some community. What has especially captured Kauffman’s attention is the proliferation of parenting listicles, those brief bullet-pointed articles you find on sites like Reddit and BuzzFeed that dispense ‘curated’ infobytes in themes like “10 Best”. No need for theories and discussions, this short form strips wisdom down to its essentials. Or so it seems. 10 Things is the series of watercolors resulting from Kauffman’s musing on child rearing. 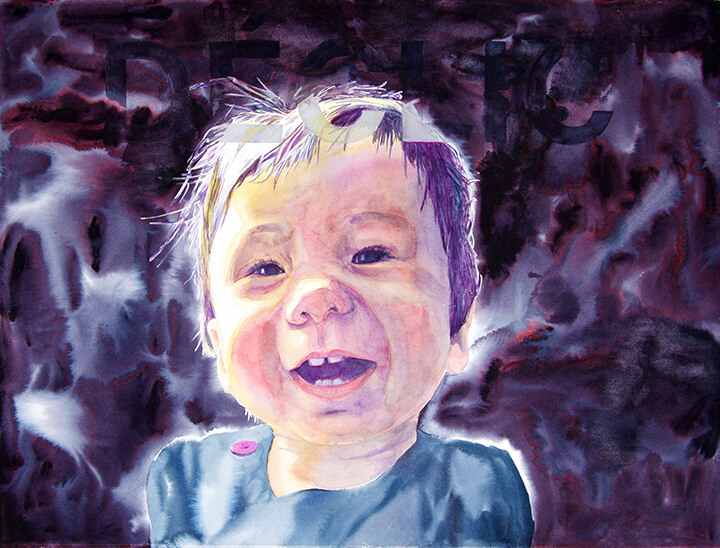 Each work features a close-up image of a tot, derived from snapshots of her young daughter, over which a word or phrase floats in large capital letters. The works are further titled with catch phrases gleaned from her combings through online sources such as message boards and Pinterest catalogs. Sometimes the internal and external captions reinforce each other; other times they mark the polarities of advice. Because it isn’t that simple and there is no one recipe. For example, consider the painting “Read To Your Baby.” It is a sunny image of a seated child in a blue shirt holding onto a piece of paper and looking directly at the viewer. Studies show that reading with your children from an early age is an indicator of later learning and literacy. However, the caption floated across this typical moment is more cautionary: Do Not Force. How do you know when it’s a good idea to move beyond Good Night Moon into Mother Goose and Dr. Seuss? How soon is too soon? It is noteworthy that Kauffman has made this caption somewhat indistinct, as if it were a tickler in the back of your mind. The saturated purple monochrome” Follow A Routine” depicts the back of a toddler walking away from the camera, reaching out toward something unseen. “Easy Does It,” declares the painting’s caption. The girl’s splayed fingers and head are beautifully silhouetted against the white light of the paper. Yet, imagining this against the lens of a parent’s anxiety, it’s almost impossible to look at the composition without remembering the speed at which toddlers dash from your grasp or, worse, thinking of the possessed television set that sucked in young Carol Ann in Poltergeist. In this manner, Kauffman has used her daughter as a kind of “poster child” for the parenting conundrum. With their text callouts, the works are instantly relatable to a common bond of caring, and the artist’s aqueous, layered approach to the watercolor medium adds a level of delicacy and insubstantiality that helps move it away from specific portraiture toward the realm of idea. Severson, on the other hand, has taken as his inspiration a parenting example from the world of celebrity. For if ever a family grew up in a glass bubble, it was the epically talented singing Jacksons (brothers Michael, Jackie, Tito, Jermaine, Marlon and Randy; sisters Rebbie, La Toya and Janet), under the patriarchal guidance of father Joe. Infamously authoritarian, it might be fair to say that Joe has been variously credited both with the success and the dysfunction of the family. One bit of Jackson family lore related to Joe’s approach to building discipline in his children was the seemingly pointless exercise of moving stacks of cinder blocks from one part of the back yard to another. Each stack had to be perfectly aligned and balanced, or the chore would begin anew. The thought was to build unison, endurance, exhibit strength in numbers and a desire for perfection that would translate into the Jackson Five’s vaunted harmonic and choreographic precision. The exercise may have promoted cohesion, but also represented an emblem of Sisyphean futility. Severson has taken this anecdote and translated into his ¼ scale assembly of cast concrete blocks entitled “Joe Jackson Jenga.” Two stacks, one tall and one short, sit on wooden pallets in the center of the gallery, representing the activity of shifting the volumes from one site to the other. Squares of artificial turf hang from a hook on the wall above the shorter tower. In typical Severson fashion, there’s an alluring craftsmanship to the simple scale replicas of the building blocks. They have a smooth, silky surface that gives them an unexpected formal elegance. And they do recall the game of Jenga, in which players remove and re-place wooden blocks from a tower form, until an unlucky move causes the structure to fall. “My current work speaks to themes of opposition and resolution, craft and production, hero and villain, natural and produced, fair and foul,” explains the artist in his Darger HQ statement. “Joe Jackson Jenga” certainly imbues most of these concepts in a pleasingly concise manner, assuming of course that you are least bit familiar with the lineage of the late King of Pop. In the end, the Kauffman/Severson pairing looks forward (personally) and back (culturally) to parenting strategies and the uncertain possibilities of raising Superkids like you were cultivating exotic flowers. Agree or not with the principles of hothousing, one thing’s for sure: it’s fertile ground for discussion. Hothouse: Elizabeth Kauffman and Luke Severson runs through August 7 at Darger HQ, 1804 Vinton Street. The gallery is open on Saturday from noon-5pm, on Sunday from noon-3pm and by appointment. For more information, visit www.dargerhq.org or call 402/209-5554.